If there were any one time to dress up during the year, New Year’s Eve would be that time! A darker suit fits with the formality of the occasion, and adding a dress shirt and tie in precious metals like gold or silver and rich tones like royal blue, navy, purple, wine, and burgundy will provide the color and complements that make an otherwise ordinary look truly memorable. Alternatively, strategic use of a crisp white dress shirt and an interesting tie can also be very effective. Even if you’re not looking to be quite so formal, these color recommendations can still apply. If you don’t want to wear a suit, consider pairing your dress shirt with dress pants in a dark color. If you still want to go for the bold, choose a pair in a light neutral like grey and pair it with a brightly colored or patterned dress shirt. One of our favorite New Year’s looks involves one of the most unique Holiday fabrications – velvet. It’s not necessarily to everyone’s taste, but a velvet sport coat can pack a real sartorial punch. It’s the way to go if you’re looking to stand out from the crowd! 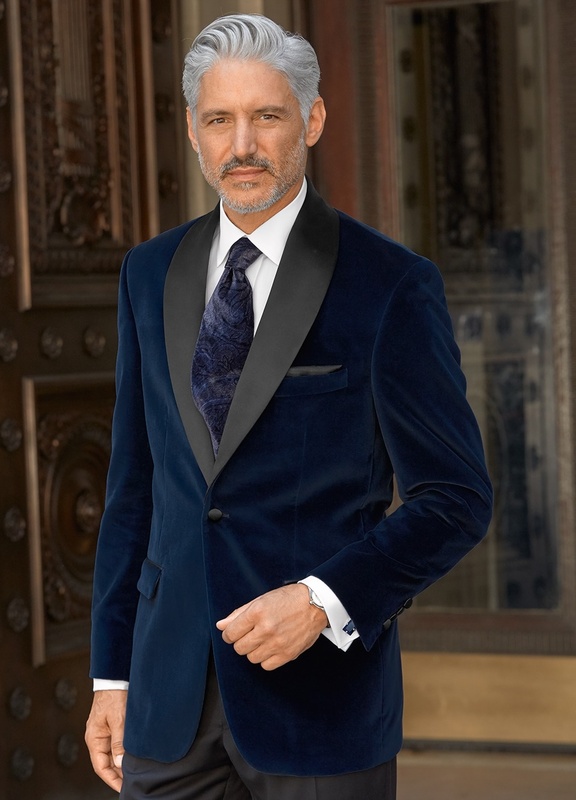 A satin shawl lapel is a detail often seen paired with velvet: it lends extra sophistication and ease to the look thanks to an inherent association with gentlemen and their leisure. Since a velvet sport coat is such a standout piece, the rest of your outfit should remain simple and crisp to keep the look in balance. In this particular instance, we’ve paired it with a clean white shirt and black pants, and as a touch of indulgence, our velvet tie. We’d like to hear from you now! What are you planning to wear to your New Year’s celebration? I am interested in your double-breasted shawl collar vest through Amazon. But I am afraid that the size would not be right. I am an Asian, height 5′ 6″, weight 135 lb., chest 38″, waist 36″. What size should I choose. Please advise. Hi Kwok, thank you for your question! We’d recommend size 38. The chest measurement of the vest itself is about 42″, and the waist measurement is about 41″ for that size, so that would probably be your best fit.